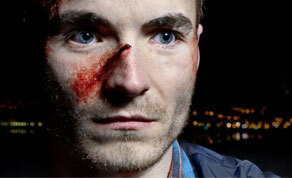 Irish actor Martin McCann in Kieron J. Walsh's 'Jump'. With success in New York, Palm Springs, and Ireland’s own IFTA event under his belt, Kieron J. Walsh is set to see his comic crime thriller ‘Jump’ unleashed upon Hollywood audiences in L.A.’s Arena Cinema this Friday, December 6th. Starring Nichola Burley (‘Street Dance’, ‘Wuthering Heights’), Martin McCann (‘The Pacific’), Richard Dormer (‘Game of Thrones’, ‘Good Vibrations’), Charlene McKenna (‘Raw’, ‘Ripper Street’) and Ciaran MacMenamin (‘One Hundred Mornings’), ‘Jump’ follows four young Derry natives whose lives collide one fateful New Year’s Eve in what the filmmakers dub as ‘a night of fast talk, wild coincidence and intrigue’. Based on the play of the same name by Lisa McGee (‘Raw’, ‘London Irish’), ‘Jump’ was co-written and directed by Walsh and shot in Belfast and Derry. Premiering in Toronto, the feature has gone on to garner awards such as Best Feature at Irish Film New York 2012 and the Bridging the Borders Award at the Palm Springs International Film Festival 2013. Now the film is set for wide release to American audiences, the initial Hollywood screenings on December 6th and 7th to be followed by DVD and video-on-demand release, handled by Breaking Glass Pictures. Produced by Hotshot Films and Blinder Films with support from Northern Ireland Screen, the Irish Film Board, BBC Northern Ireland Limelight and Molinaire, ‘Jump’ opened across Irish cinemas in April of this year. To view a trailer for the film, click below.